When global food prices spiked dramatically in late 2007 and into 2008, the costs of many basic dietary staples doubled or even tripled around the world, sparking protests and riots. Panicked governments stopped exporting food, aggravating the crisis. Almost as troubling: the crisis had taken the world by surprise. To keep it from happening again, international leaders created an agricultural monitoring group, bringing together representatives from governments and aid groups. The initiative, dubbed the Group on Earth Observation’s Global Agricultural Monitoring (GEOGLAM), looked in large part to data from Earth-imaging satellites, hoping to use it to make better predictions about weather and future crops. One of the key crops to monitor was rice. It is a majorfood staple for billions of people around the world, including in some of the world’s poorest regions. But it is one of the most complicated crops to make predictions about, and it has no sizeable futures market, largely because traders are missing the kind of information GEOGLAM was founded to provide. consumers at risk. A flood or drought in Southeast Asia can mean hundreds of thousands of people worldwide will starve.The GEOGLAM initiative set about to change that. Among the satellites most popularly used for Earth-imaging data are the Landsat series, in orbit since 1972. 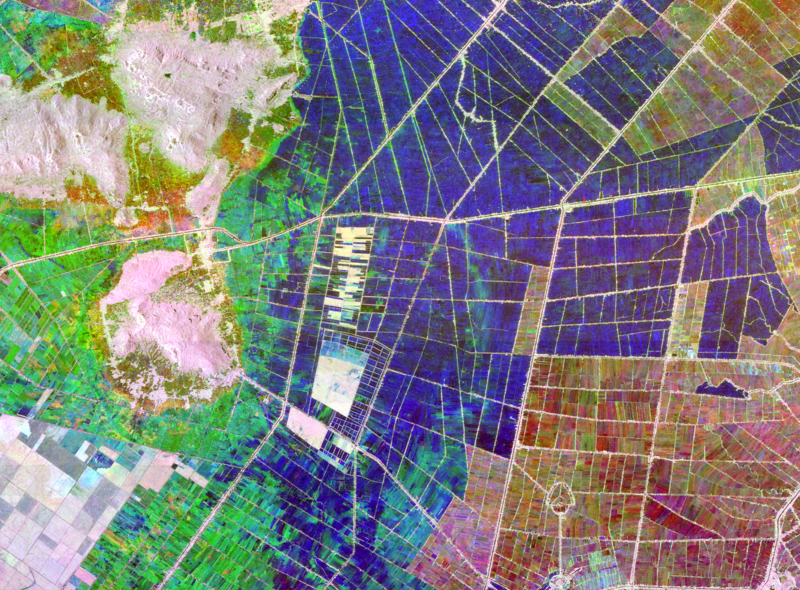 The latest, Landsat 8, launched in 2013 and covers Earth’s surface every 16 days, capturing images in a variety of ways, including two thermal infrared bandwidths. The thermal information is especially important for detecting crop stress and supporting crop predictions, as it reveals moisture and temperature on the land surface, in plants and in the lower atmosphere. The Terra and Aqua satellites also provide important images of Earth using the Moderate-Resolution Imaging Spectrometer (MODIS) instrument. They map Earth every day or two in 36 visible and infrared bandwidths. The frequency of those images helps monitor changes in crop stages, plants’ responses to weather and farm activities such as irrigation or tillage. Making predictions based on raw satellite data, however, is no simple task. “You have to be an expert to transform that data into useful information,” says Nathan Torbick. That’s where Torbick’s company, Applied Geosolutions, came in. The company, where Torbick is a director, has for a decade been researching applications for Earth-imaging satellite data. With the help of two Small Business Innovation Research contracts from Stennis Space Center, they designed a web-based program, called the Rice Decision Support System (RDSS). The software combines data from NASA satellites and others, incorporating measures of rice fields, yield modeling and weather forecasts “to give you a complete picture of what’s going on on the ground,” says Torbick. Using that data, it then generates information in real time about rice coverage, growth stages, deviations from normal, and expected yield around the globe. Abroad, the system is focused on pilot sites in Java, Indonesia, and Vietnam, where the data gathered is used primarily for supporting food-security programs and commodity markets. In the United States, parts of the country’s two biggest rice-producing regions — Eastern Arkansas and the Sacramento Valley — are running out of water. There, Applied GeoSolutions has paid partnerships with farmers and agencies to help them plan their growing season and manage resources, especially irrigation. The imagery also proves which farms should receive incentives for using alternative irrigation methods, a function RDSS also performs at a pilot site in Brazil. Applied GeoSolutions now supports the GEOGLAM initiative, helping to supply producers, buyers and investors worldwide with more detailed, comprehensive information and projections about rice production. “When we’re blind to what production will be, the market becomes speculative, and volatility prevails. This is not good for business, government, or consumers,” says Bradley Doorn, program manager for the Water Resources Applied Sciences program in NASA Headquarters’ Earth Sciences Division. To learn more about this NASA spinoff, read the original article from Spinoff 2016.